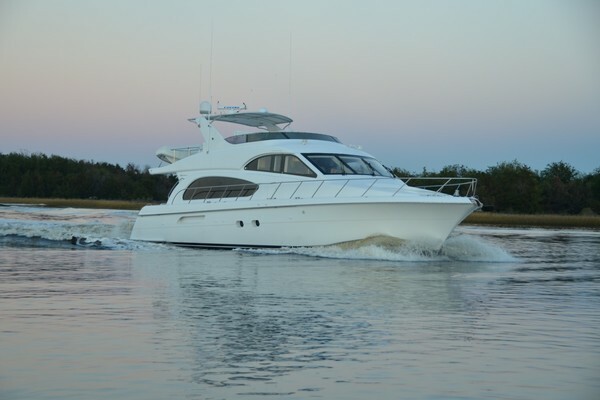 United Yacht Sales New Jersey would love to guide you through a personal showing of this 75' Horizon E75 2018. This yacht for sale is located in Unknown United States. For pricing details or a showing please contact us by filling out the form on this page and we will get back to you shortly! The E75 model offers a multi-functional and customizable layout that maximizes space and features numerous innovative and convenient amenities; clients have their choice of main-deck configuration depending on their cruising lifestyle. Options include the traditional galley forward, dining area midship, salon aft layout as well as galley midship or galley aft configuration. Large windows and sliding glass doors opening onto the aft deck create a seamless indoor/outdoor entertaining space that encompasses 49’ 3” (15M). The E75 echoes the stylish exterior lines of the E88 motoryacht and offers expansive exterior areas in either a skylounge or open bridge configuration. The boat deck features a bar with refrigerator and barbecue grill as well as the option of a Jacuzzi. The forward deck is fitted with sunpads and a dinette for eight guests while the main deck aft features a dinette and a large teak table for eight. A hydraulic hi-lo swim platform with dive gear stowage to either side of the transom door allows for easy dive preparation and water access. The efficient use of space aboard the E75 continues in the design of the lower deck, which is offered in a three stateroom/two head or three stateroom/three head layout. The master suite spans the yacht’s 18’6” (5.64M) beam and features a walk-in closet as well as a his-and-hers ensuite with separate shower and tub. A VIP stateroom is located forward, with a convertible twin/guest stateroom to starboard. Well-appointed crew quarters featuring bunk berths, a bathroom, a full-height refrigerator, basin, working bench, and washer/dryer are situated at the stern. The Horizon E75 can be equipped with standard Caterpillar C18A 1150HP engines or the upgraded Caterpillar C32 1600HP engines; an upgraded fuel capacity of 1,800 USG is also available. Upgraded C32A 1600HP engines available.